The interior of the Sinai peninsula is a stark, unforgiving place. Beneath a strikingly blue sky, lie parched mountains, rocky outcrops and great expanses of barren sand, interspersed with isolated oases and crisscrossed by medieval pilgrimage routes. It is, in the truest sense, a landscape of biblical proportions. In the south of this region, just a few hours drive from the booming tourist resort of Sharm el-Sheikh, rises the magnificent 2285m Mount Sinai, venerated by Christians, Muslims and Jews alike as the site of God’s unveiling of the Ten Commandments. Although there is some doubt about whether this red and grey granite peak is actually the site mentioned in the bible, it is undeniably awe-inspiring – particularly the views from the summit, which is reached via 3750 knee-crunching “Steps of Repentance”, or the easier but longer “camel path”. Despite the crowds of pilgrims, travellers and Bedouin guides (and their camels), a night camped out here under an impossibly star-filled sky allows you to wake up to one of the most beautiful sunrises imaginable. 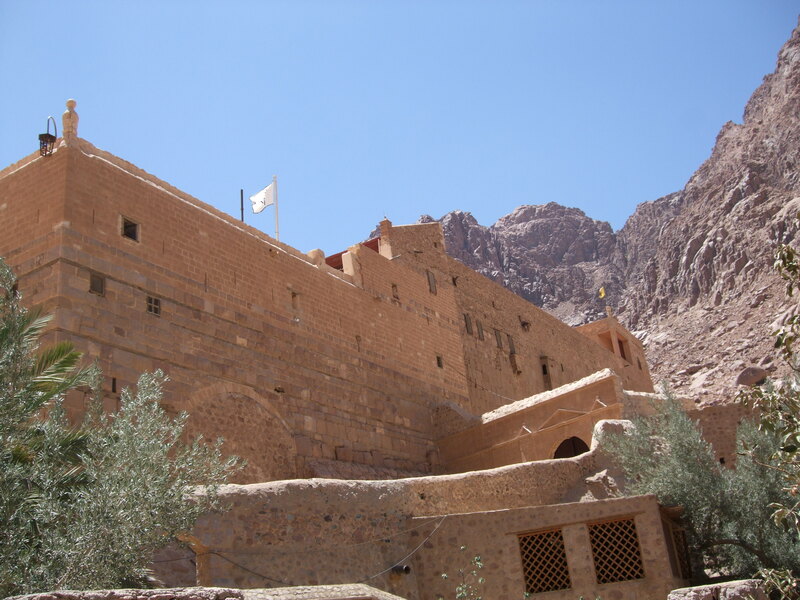 Almost as atmospheric – and considerably more comfortable – is a stay at the guesthouse in the grounds of the imposing St Catherine’s Monastery, which stands at the foot of Mount Sinai. Dating back to 337BC, this active Greek Orthodox monastery looks more like a fortress than a place of religious devotion. Behind its forbidding walls is what is reputedto be the burning bush from which God spoke to Moses, as well as a library containing innumerable priceless texts and manuscripts, including fragments of the world’s oldest bible, the 1600-year-old Codex Sinaiticus.